A short and adventurous journey through the north-east of Vietnam, one of the most stunning areas, we will experience part of the northern Vietnam fishing and agricultural culture, witnessing spectacular scenery as well as the colorful and non- touristy of hill tribe villages, staying in local guesthouses and sampling the cuisine unique to this mountainous region. Different type of hill tribe people. Begin this exotic journey North-East from your hotel in Hanoi, we drive up and pass through the undulating terrain of tea plantation. On the way, we will make a break and visit at the museum of Ethnology in Thai Nguyen town; then we keep moving through many other timeless villages near the road. 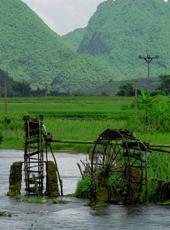 This is the first glimpse of rural Vietnam and sets the tone for the days ahead. Today we will have lunch in a local restaurant in Bac Can before reaching Ba Be area. Arrival in Ba Be National Park in the early afternoon, we check into the homestay in Pac Ngoi Village of the Tay minority then it is our free time for strolling around the village relaxing in the National Park Area. Tonight, we will have dinner and homestay with the Tay minority. Heading out of Cao Bang town, we start venturing into the most remote northern region of Cao Bang Province. The scenic roads traverse Trung Khanh before arriving at the famous Ban Gioc Waterfall, the biggest waterfall in Vietnam (may not have full of water in the dry season). This enormous cave has two main entrances and one branch reaching almost all the way to the waterfalls where is a ‘secret’ entrance. We will be back to Cao Bang in the afternoon then it is free time relaxing and exploring Cao Bang Town. We get the drive to That Khe throught Dong Khe then heading for Lang Son (the border town had been all destroyed during the recent Sino – Vietnamese war, but was rebuilt to become an important trade center in north-eastern region). We can make some breaks en routes as you wish to visit hill tribe villages and take pictures. The central market of Dong Kinh – Lang Son and the legendary Tam Thanh Cave are visited this morning before we travel by roads back to Hanoi through many mountain areas. Their breathtaking scenery is some of the best in Asia. We encounter en route many ethnic minorities doing their daily works such as logging, herding buffalo and tilling the field. We arrive in Hanoi around 5 p.m. Our adventure ends at your hotel in Hanoi. Accommodation during journey is basic; especially, homestay with minority people in a very basic condition. Best Time to Do: all year round, best from September to April of next year. This private tour can be customized upon your request. Please contact us with details of your tour requirements via email or telephone. Our team of experienced travel consultants will then help you design your dream Vietnam vacation.